Foxes will have a serious effect on your chickens if they get to them. Protect them with the best netting available. The availability of electric fencing has transformed free-range poultry keeping. It is arguable that without it, the keeping of extensive, free-range commercial poultry flocks would never have happened. Agrisellex have now increased that range by introducing the tallest true electrified Poultry net onto the market. Showing the height of the net for greatest protection. The new Ultimate electrified Poultry Net is 145cm/4ft 10inches tall and has a simple lightweight design that allows for easy erection in practically any location. When correctly installed and connected to a suitable energiser the Ultimate Poultry net will secure your poultry from predatory foxes. More people are keeping friendly chickens in their back yard because you love the returns they offer. Why should you have to keep them penned into small runs just to prevent a murdering Fox from killing your flock? Let your chickens roam and range once more within the safety of an Ultimate Electric Poultry Net; give yourself the satisfaction of giving your birds a much better quality of life than cooping them up in a small enclosed run. Electric Netting has been proven over many years to be extremely effective in deterring even the boldest fox. • A Super tall 145 cm/ 4ft. 10in. Electric Net perfect for totally excluding all predators and most deer. • The close 7.5 x 5cm weave will keep all poultry within the net easily. • The stiff posts are attached to the mesh to increase the stability of the net once erected. 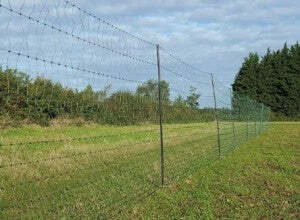 • Netting is widely shown to be highly effective at protecting your sheep and poultry from wolves and foxes. • These taller nets will exclude even those hardy jumpers and the greater height will keep most of your adventurous adult poultry in. • Both top and bottom wires are re-inforced for added strength to assist in pulling the net out. • For the maximum possible protection, couple these nets with a hotSHOCK energizer and deliver a Devilish sting to the fox. 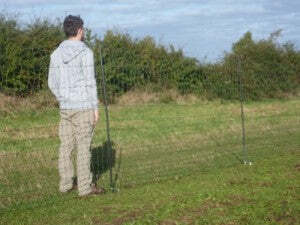 • An ideal net to exclude Foxes from your property and prevent them consuming your poultry. • Poultry are not the greatest fliers so the extra height helps to keep them in the run and safe. • This lightweight electric chicken netting may be rapidly dismantled, bundled up and re-erected in another area. It is effective at allowing poultry access to specific grazing areas so allowing rested areas to re-grow, re- vitalise, as well as excluding a fox.